Yes, as in, get down on one knee and ask me to marry him in the most frantic pedestrian crossing in the planet. It was hard to imagine someone kneeling in the midst of all that madness, when walking was already enough of a struggle! I was the one who made the ENTIRE itinerary. And I only got to finish and print it the night before our flight, so how else will he have the time to plan a proposal when (I bet) he didn’t even bother reading my super detailed / OCD-charged itinerary? We had a little pre-flight fight. Right before our 5:25 AM flight, I came all the way from Tagaytay to host an out-of-town wedding. Because I was so anxious (pre-trip jitters + pre-wedding hosting jitters + ZERO sleep), I completely forgot to update him of my whereabouts. So when I got home, he was absolutely pissed that I did not even send one text message just to let him know that I was okay. It was sweet of him to worry, and wrong of me not to text. My bad! There were no signs. Nothing! I must say, Mike is a pretty awesome actor. What I did know was that both Mike and I wanted to get married by 2015. We both openly discuss our future plans, and have always known that marriage was something that was going to happen for us very soon. I just didn’t expect it to be that soon! 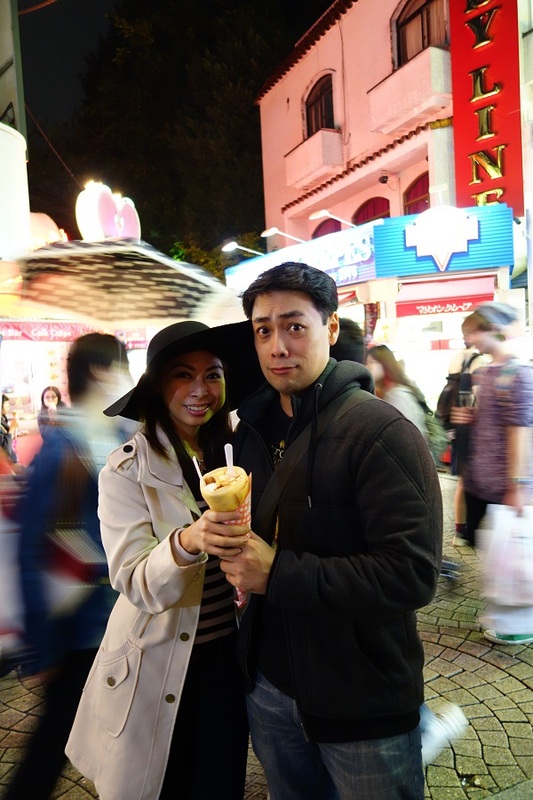 And I certainly did not expect it to happen on our very first day in Japan! 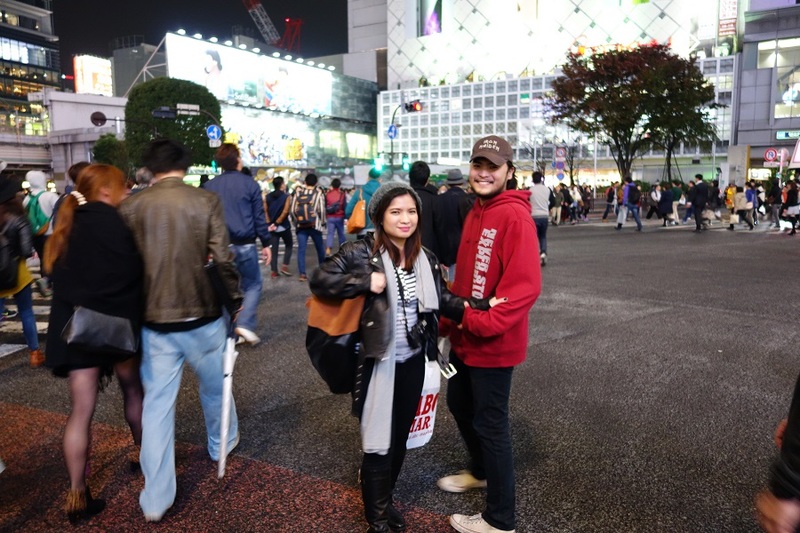 According to our friend Paula, the “plan” actually started to materialize (without me knowing it) even before we got to Shibuya. 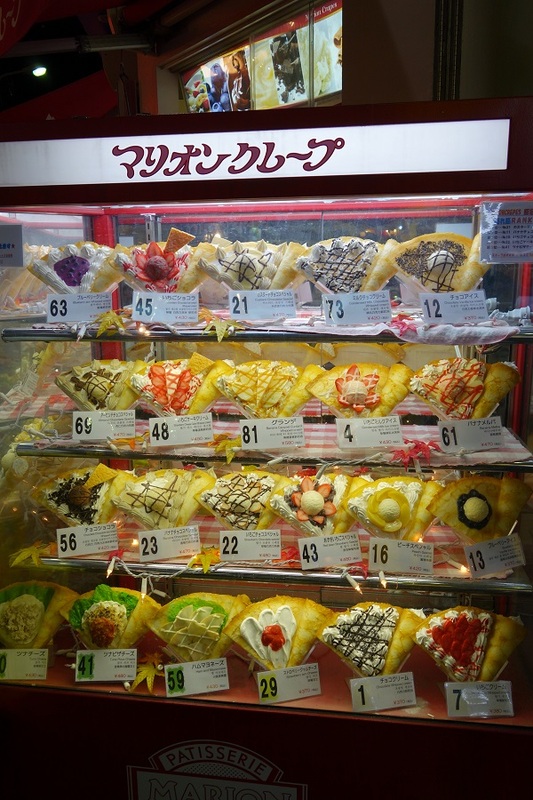 Before Shibuya, we (Mike, Paula, Eric, and I) first had dinner in Harajuku and I was hell-bent on getting one of those famous Harajuku crêpes for dessert. Because Mike wanted me to be happy, and he wanted the mood to be happy, he indulged me, gave in to my cravings, and treated me to a delicious crêpe. Well, that made me happy, alright! This was all part of the plan, even if it was just a spur-of-the-moment addition to the original plan. 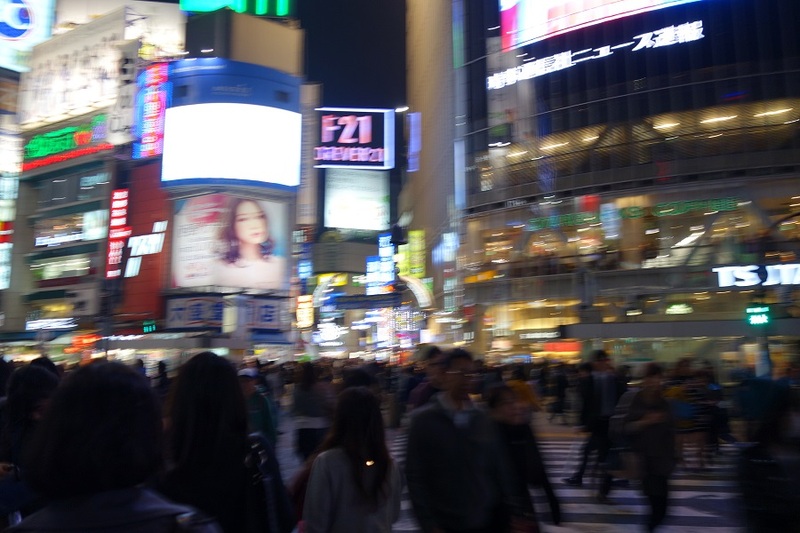 Then we moved on to Shibuya, where, unbeknownst to me, my life was going to change forever. These photos have nothing to do with the engagement. 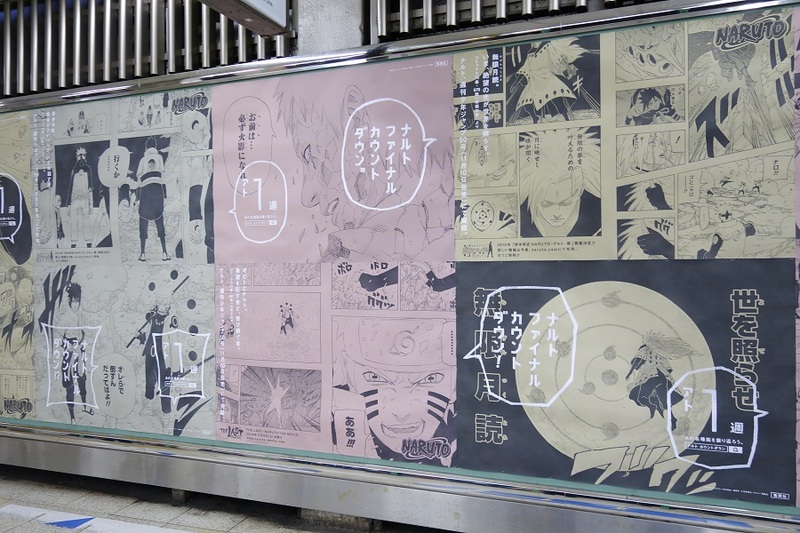 I just wanted to share some artworks in the Shibuya station because they’re kind of cool. 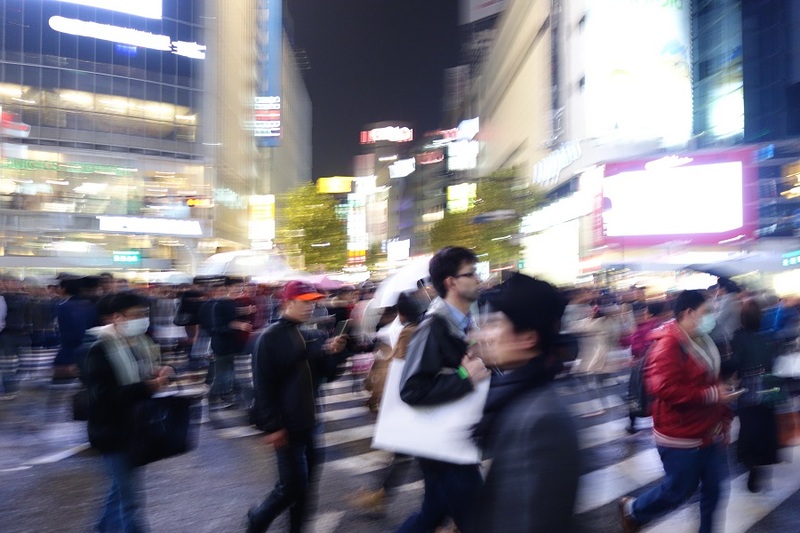 We finally got out of the Shibuya station exit and I was immediately overpowered by the brightness and dynamism of Shibuya. 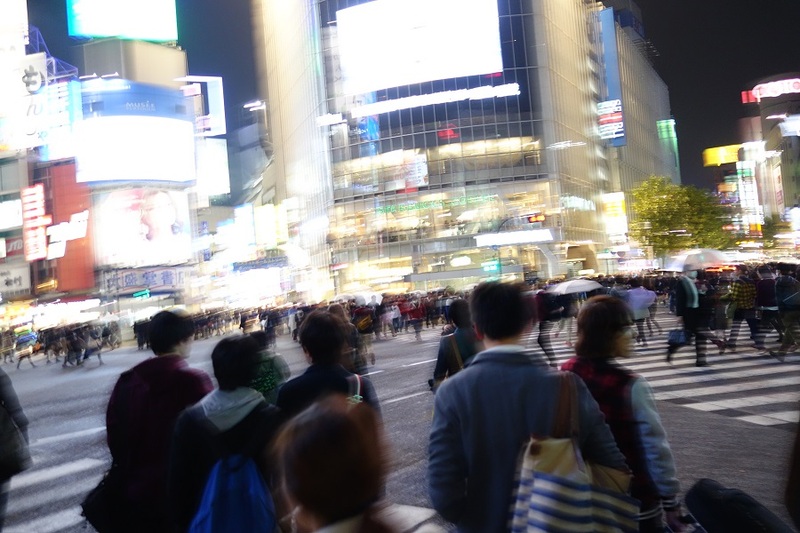 The deluge of people, the vehicles moving from every corner, the huge television screens flashing from each edifice, the luminous billboards and buildings — there was no question. 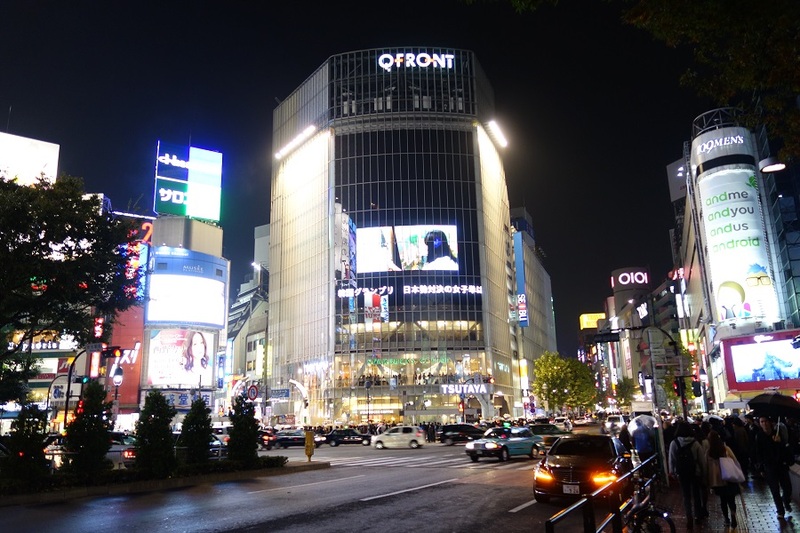 I WAS OH SO IN TOKYO! 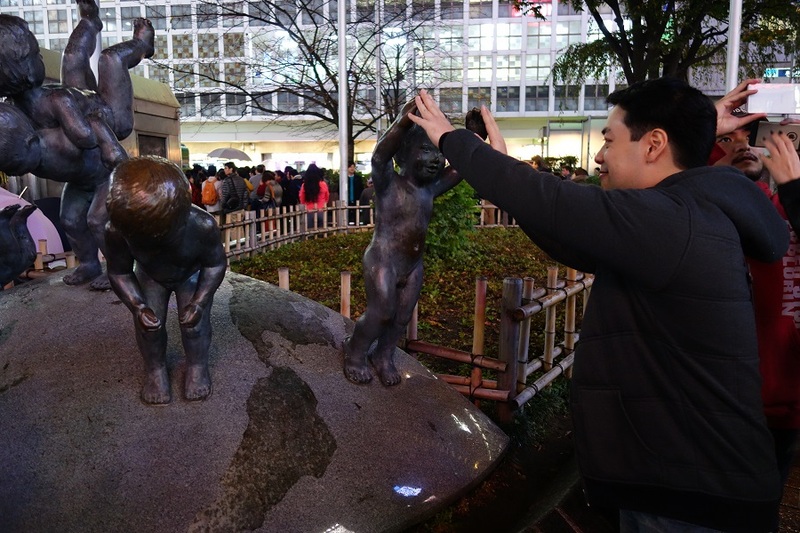 I was getting closer to the seeing the statue of Hachiko, and was about to cross that off my bucket list, when Mike saw this funny-looking sculpture of three Bronze babies, and decided to take a photo with it. At this point, I still had no idea what was about to happen. I mean, does this look like someone who is just about to ask his girlfriend to marry him?! For someone who’s about to propose, surprisingly, Mike looks like he’s got his sh*t together. 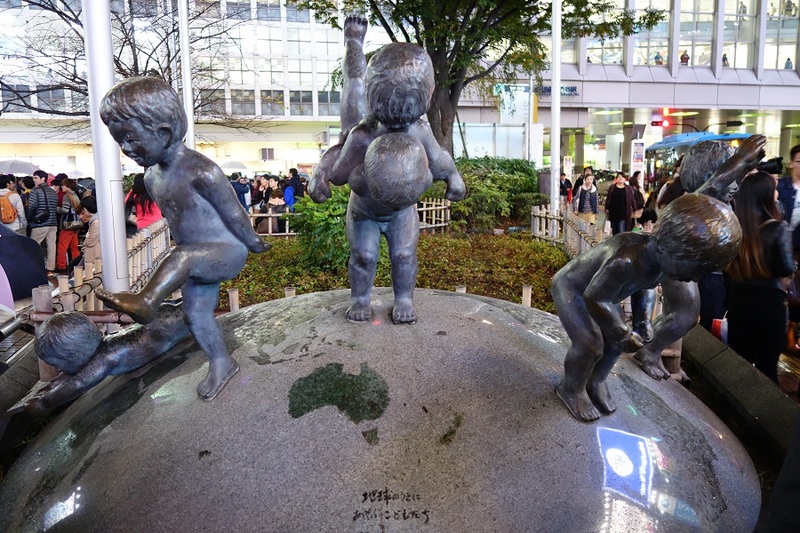 The bronze baby statues in Shibuya. What the hell are they doing? Mike wanted to take a photo of that green patch, which is Australia, his hometown. Blurry! Too much action for my camera! Let’s try this one more time. Ugh. Nope. Ahh, finally! A clear shot of my (cute) friends Eric and Paula! I thought it was only my photos that were going to be blurry, but as it turns out, the episode after taking those photos was going to be a blur too! And just like that, we were engaged! So that’s what being proposed to feels like! Maybe it varies from person to person, but for me, it felt like I was experiencing an astral projection. Part of me was thinking “It’s finally happening!” while another part of me was thinking, “Is this really happening? 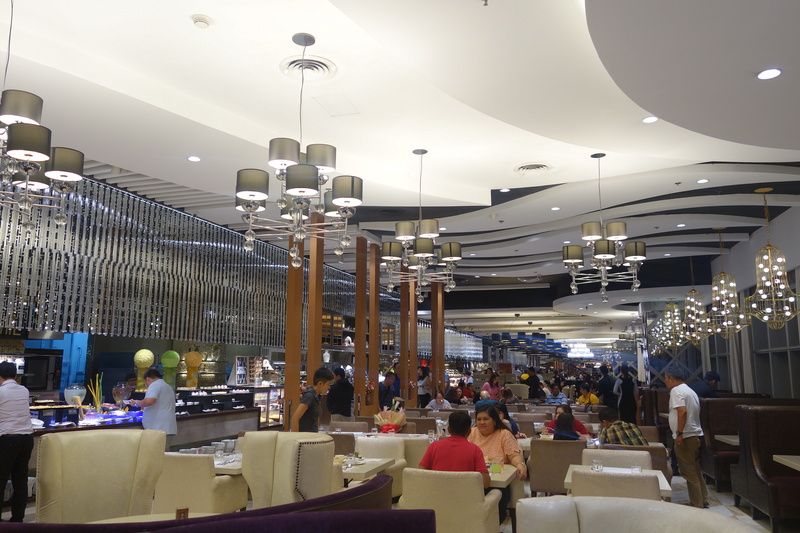 !” Plus, the hordes of people passing and all the bright lights flashing made everything feel more trippy! Good documentation – because in my euphoric state, I might not remember everything that happened or was said. True enough, having photos and videos of the proposal helped me relive the events that happened that night! I call Paula (who I refer to as “Mimi”) and signal her and Eric to start crossing, and she says “Game!” Both their camera and phone were up the whole time, and I thought they were merely taking pictures of the scenery, just like me. Mike gets up, and I give him a big hug as I giggle and squeal like a little girl, with Paula still shrieking incessantly. In the elation and excitement of it all, Mike and I completely forgot that we were still standing right smack in the middle of the intersection! 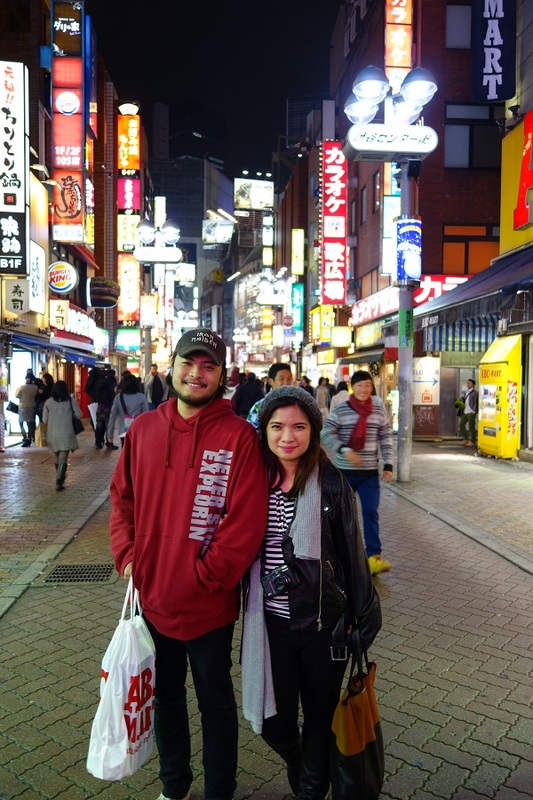 We had not realized that the traffic lights have turned green and the vehicles were already approaching us until Paula frantically said, “Andyan na yung cars! Balik tayo!” (“The cars are coming! Let’s go back!”) Hahaha! It would have been tragic to get engaged and then get hit by a car only seconds later! In all fairness to the drivers, they actually waited patiently and politely for us to have our moment, snap out of it, and get to the other side of the street. Some of them actually stopped for us while some just avoided us entirely. I guess they were happy for us too because they didn’t honk their horns at us or yell “get the f*ck out of the way!! !” Haha! 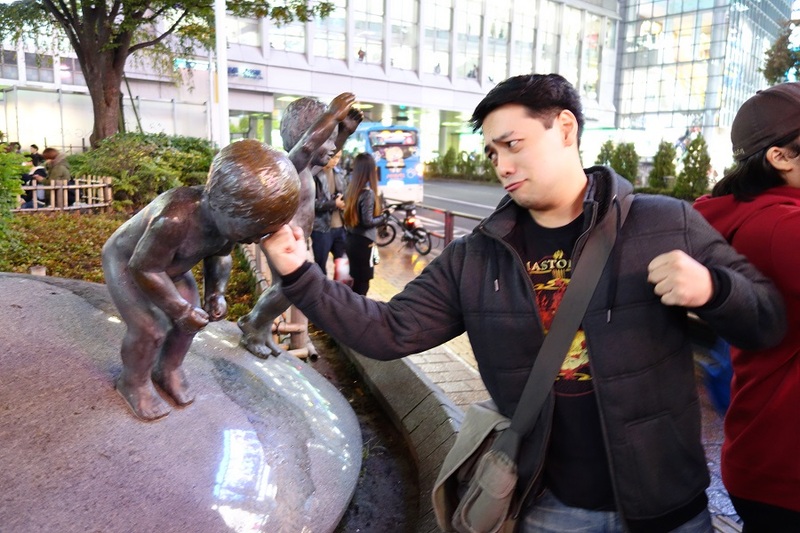 Japanese people are so awesome! If this proposal took place in EDSA in Manila, the four of us would have already been bulldozed by buses like a bunch of stray cats. As you continue watching the video, you’ll see that it gets shaky as we all run back to safety to the corner of the street. 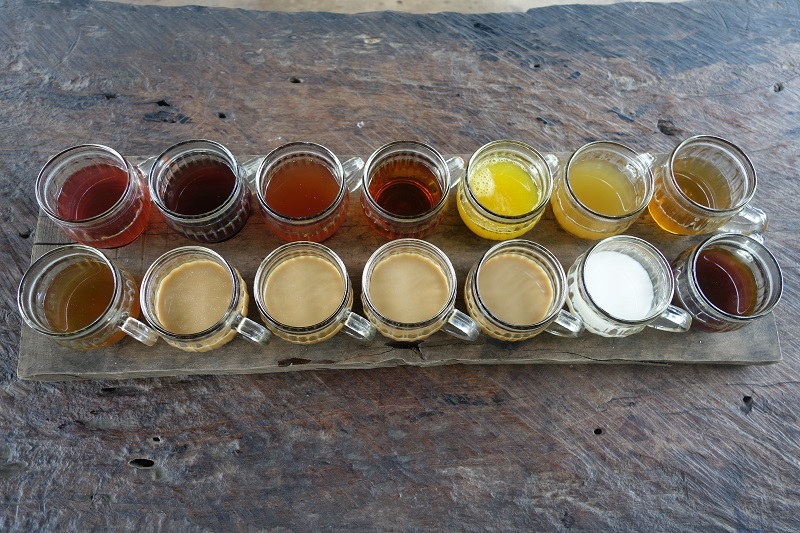 You’ll also hear a monkey making screeching noises… but there was no monkey. That was just me, going “Whaaaat?! Whaaat?! 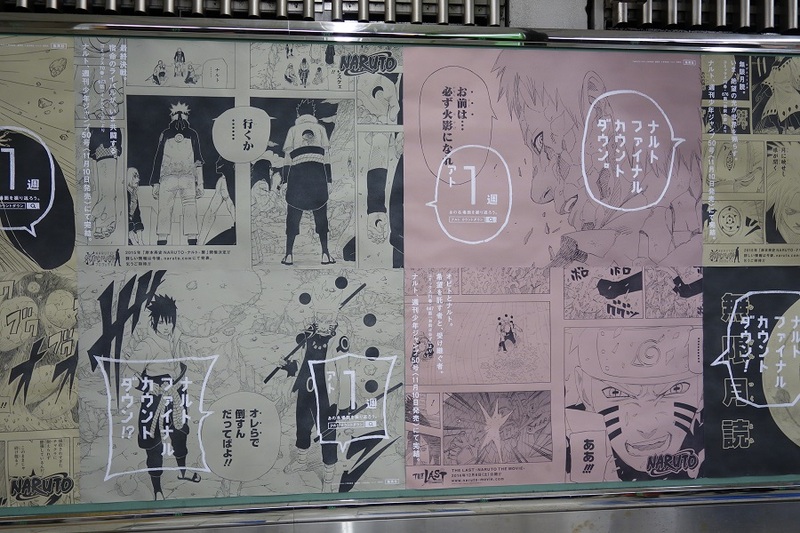 Oh my gooood! Wooohoooo!” with Mike laughing and Paula still doing that supportive screaming. Finally, we reach the side of the road, and Mike and I share a long embrace. As he held me close, I started to tear up a little and Paula goes “Aww, Mimi!” (She calls me “Mimi” too. Long story.) I realized I wanted to take a photo of the pretty ring on my finger then remembered “Hindi ako nagpa-manicure!” (“I didn’t get a manicure!”) Haha! I was totally unprepared! Mike gives me a kiss, and he touches and soothes my face (something he does that I absolutely love). Still in disbelief, I ask, “Really”? He says “yes,” and I say, “So when are we getting married? Wahaha!” (My irritating cackle totally ruined the sweet moment). “Yayyy!” I exclaim happily. Then I asked, “Does my mom know about this?” Mike said before that he was going to talk to my mom first anyway even if I didn’t ask him to. So when he nodded, I shrieked in happiness again! Everything was just perfect! 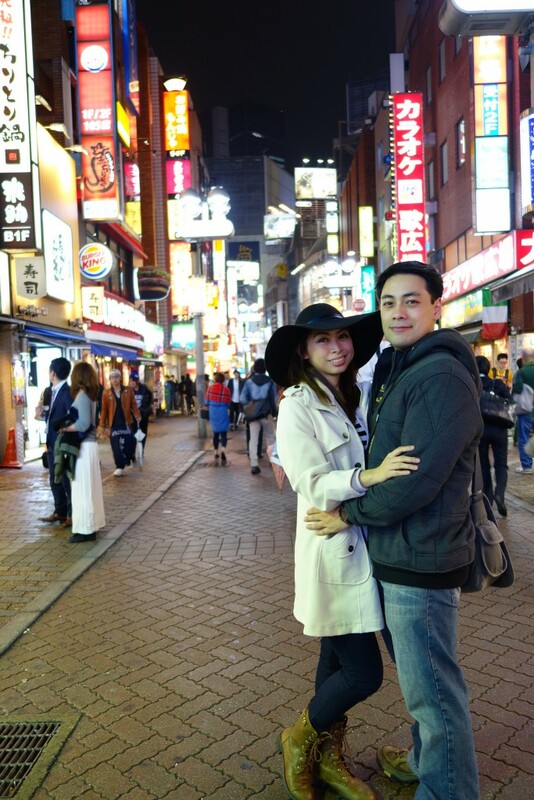 Paula and Eric cheered for us again, and Paula said, “Okay, pre-nup na dito! Hahaha!” (“Okay, have your pre-nup photo shoot here now! Hahaha!”) I joked, “Sana sinabihan niyo ako, ginandahan ko mga damit ko!” (“I wish you had told me about this, I would have brought nicer clothes!”) Haha! He asked and I said “woohooo!! 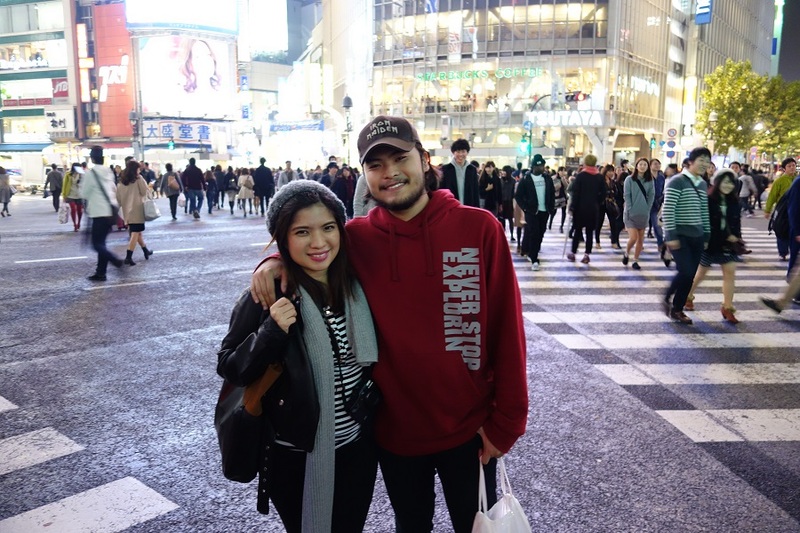 !” Officially engaged to my best friend at the Shibuya Crossing! Our sneaky accomplices. I gotta hand it to these two! Mike and I are going to be forever grateful to Paula and Eric for helping make all of this happen, and for documenting this crazy / sweet / fun / death-defying proposal! They were able to keep everything under wraps not only on that day but even for months before the proposal! They even risked their lives by capturing the moment in the middle of a wild intersection. True friends will die for you, and that’s what they (almost) did! It took a while before everything started to really sink in. 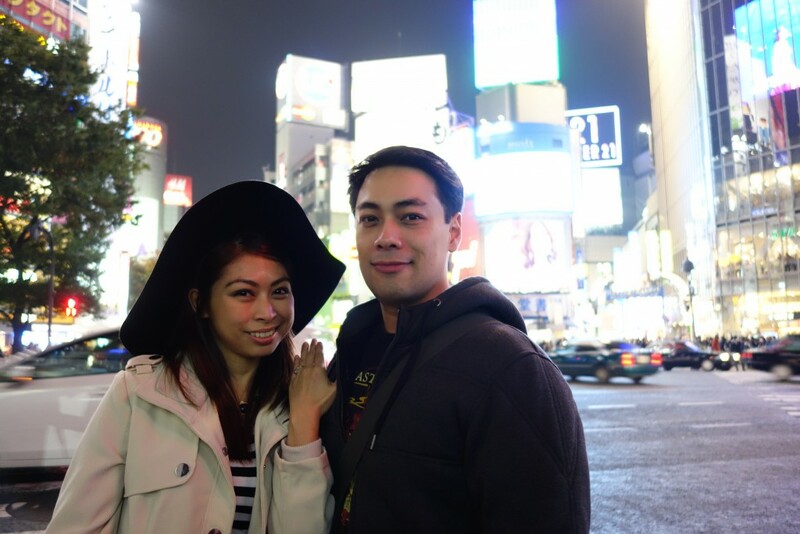 After the proposal, we went on to explore Shibuya, and that’s when I started asking questions. Nadine: “When did you tell my mom? How did you tell her? Here’s the ring! He liked it so he put a SUN on it! …I told Mike that if he was planning on proposing to me, I didn’t want an expensive engagement ring because he can use the money for other more important things. 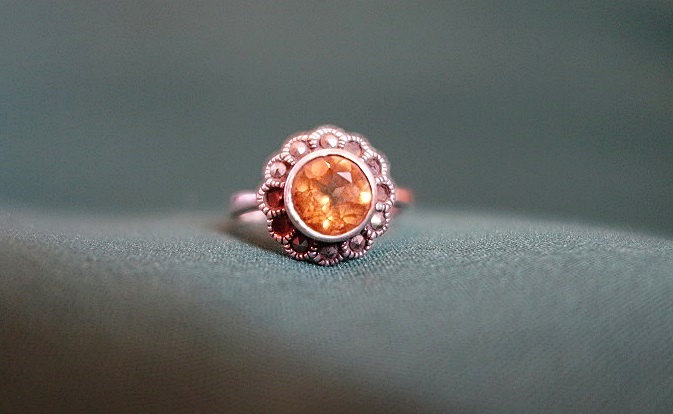 So he got me this: not an expensive ring, but a precious one because of its meaning. It looks like a sun AND a sunflower. Mike used to call me his “sunshine” during the first few months we were dating because of my sunny disposition and how I bring light to his life. And as for the sunflower bit, for our first Halloween as a couple, I went as the Sunflower from Plants vs. Zombies while he went as a Zombie. On our flight back home, he told me that this was just a “temporary” ring and that if I still want a diamond ring, he can get one for me. But why would I want a diamond when I already have the sun?! I love my “Symbolic Sunflower”! 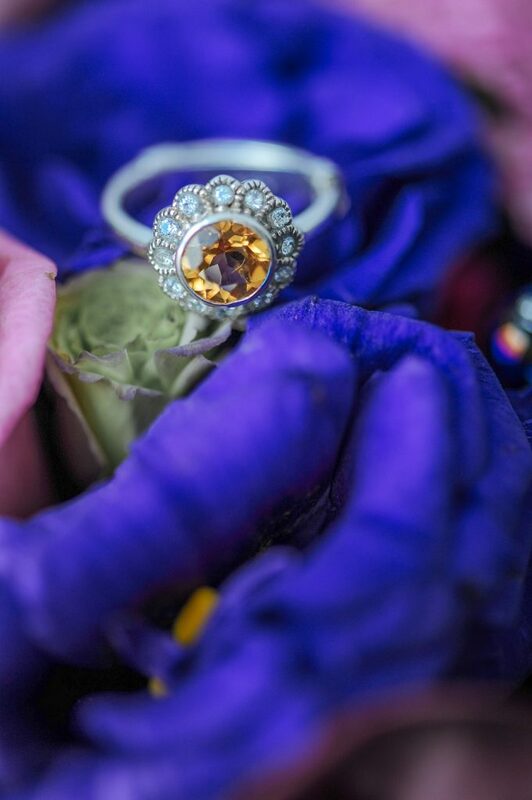 And it looks like a pretty heirloom ring, doesn’t it? I remember still feeling a little stunned minutes after the proposal. Paula even caught me in a state of trance. Haha! 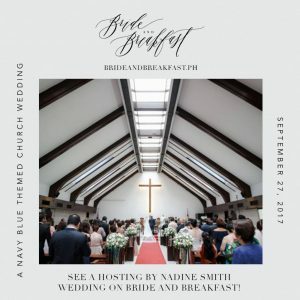 I was just so overwhelmed, not only because of the proposal per se, but with the thought that Mike went out of his way to plan everything for me. He orchestrated a wonderful proposal because he knew that that would make me happy. Suddenly, everything came back to me — the first time we met, our first dates, the time when we said our goodbyes in tears at the airport as he left for Australia, the time when we joyfully reunited in the Philippines after 3 months of being apart. The flash flood of memories washed over me, and I realized how all the little puzzle pieces of our lives magically came together and led us to this particular moment. My heart was brimming with so much happiness at the thought that I will be spending the rest of my life with my soulmate, my best friend. my greatest love. 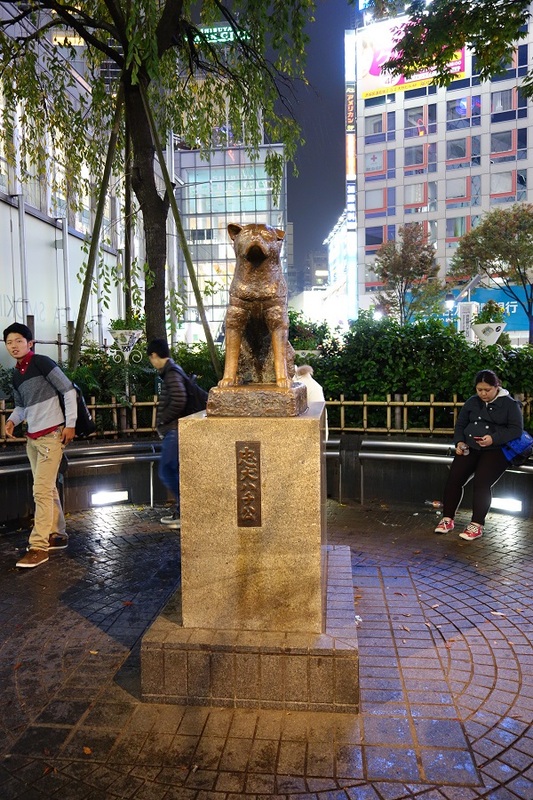 After the engagement ecstasy simmered down a little, I asked, “Okay, now may I take a photo of Hachiko?” Mike, Eric, and Paula said “yes” and so we went back to the site where the bronze sculpture of the famous loyal dog was erected. 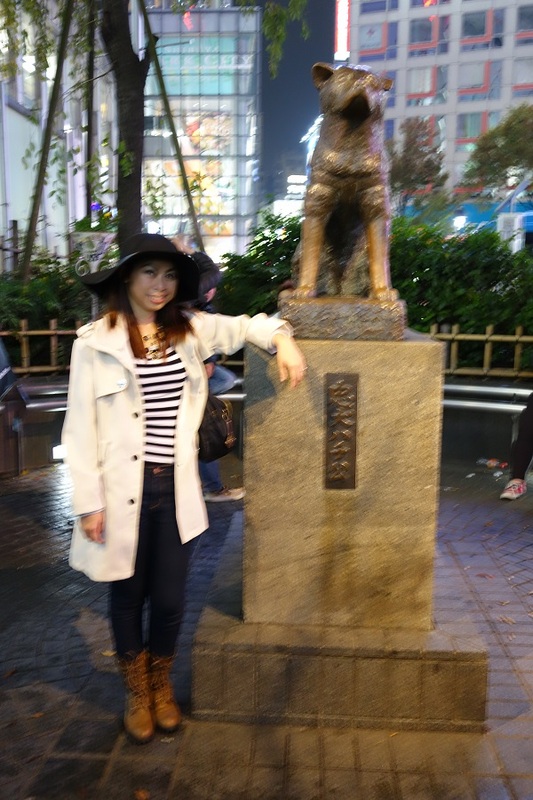 Unfortunately, my one and only photo with Hachiko kind of sucked, but I was still too overjoyed from the proposal to even care! 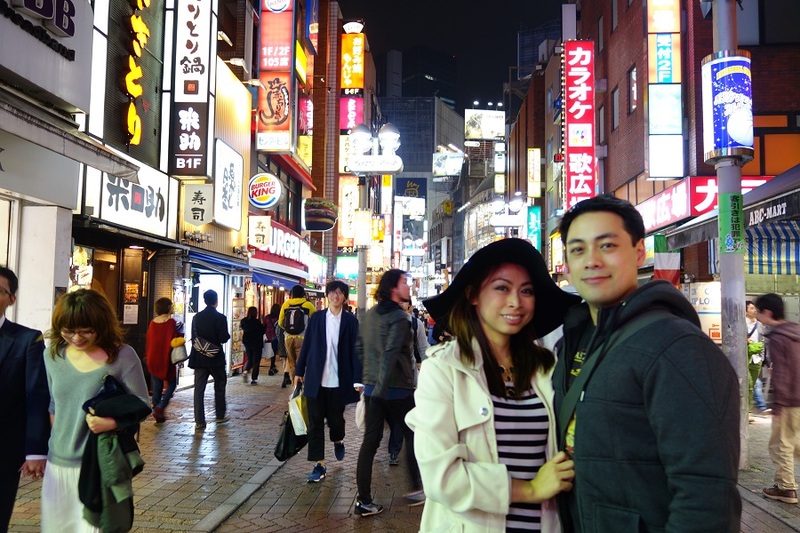 A lot of my photos from our first stop in Shibuya are hazy, just like the scenes of the proposal. But despite a lot of the images being blurry that night, one thing was crystal clear: sharing a life and future with Mike will always be my favorite adventure. We got engaged on November 9, 2014 in the craziest crossing in the world! 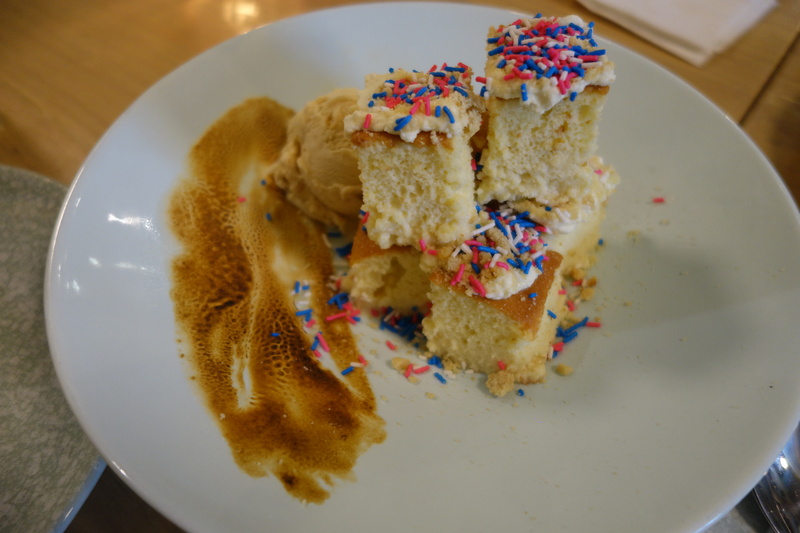 That was quite a mind-blowing #PuffAndFluffAdventure! oh and ang saya basahin syempre but of course you know that already. so going back, anong camera gamit niyo? ganda ng pics!!!! 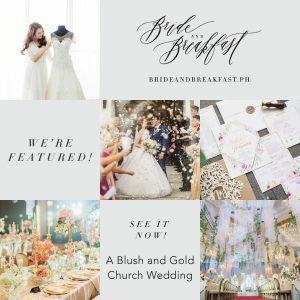 Ibig sabihin hindi mo talaga binasa kasi minention ko yung camera sa blog post! Hahaha! Congratulations sis! I am so happy for you. Kilig much lang ang peg ko. The ring is indeed so cute. Congratulations! The ring is so nice!